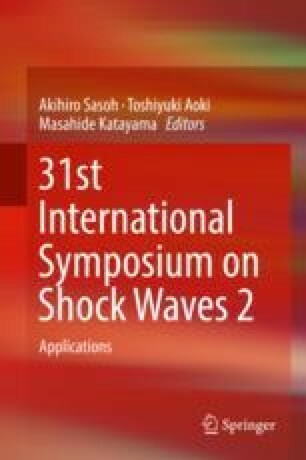 Shock waves (SW) have been applied to a variety of medical treatments. Recent studies have focused on applications within microenvironments. On the other hand, blast-induced traumatic injury (bTBI) became a social problem after the Iraq and Afghanistan conflict, and SW is gaining attention to understand the mechanism of primary bTBI. This paper reports a preliminary experimental result of SW propagation in simulated biomedical materials for understanding mechanism of both potential complication of medical application of SW within the cranium and bTBI. SW, generated by detonating of a 10 mg silver azide (AgN3) pellet, was interacted with a brain model using simulated biomedical materials. The process of SW interaction with a brain model was visualized by shadowgraph method and recorded by a high-speed video camera. The pressure history in a brain model was measured by a polyvinylidene fluoride needle hydrophone. The present experiment showed occurrence of complex wave front at specific location within the chamber and indicated the importance of understanding SW propagation effect when applying SW above certain overpressure. We will also summarize current research of complication of SW medical application and also bTBI.